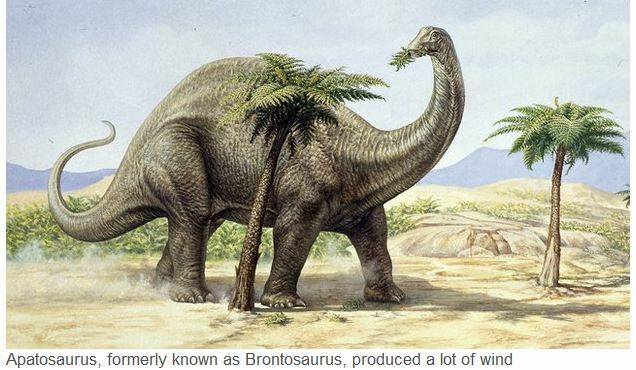 “Giant dinosaurs could have warmed the planet with their flatulence, say researchers. By scaling up the digestive wind of cows, they estimate that the population of dinosaurs – as a whole – produced 520 million tonnes of gas annually. David Wilkinson from Liverpool John Moore’s University, and colleagues from the University of London and the University of Glasgow published their results in the journal Current Biology. Sauropods, such as Apatosaurus louise (formerly known as Brontosaurus), were super-sized land animals that grazed on vegetation during the Mesozoic Era. For Dr Wilkinson, it was not the giants that were of interest but the microscopic organisms living inside…. “Cows today produce something like 50-100 [million tonnes] per year. Our best estimate for Sauropods is around 520 [million tonnes],” said Dr Wilkinson”.